I’ve got a new camera! Well, it has been a long time coming but I sold my 1d MK II and bought a 5d MK II! Here is a bit of a background for you. I held out for a long time when it came to converting to digital. I made a point of waiting until the cameras that were available would provide the appropriate quality, but also would provide high speed autofocus, frames per second and a decent crop factor. I made a pact with myself that I would get a digital camera as soon as 8fps was available and as soon as that was available in a quality body. Turns out Canon came out with the 1d MK II and I just happened to tear my ACL at the same time. Well, under the influence of pain killers and boredom from recovery I clicked the buy button and a week or so later I had a new camera! The incredible thing is the price. That camera was $4595! I can’t believe I clicked that button! That camera took me through a huge number of adventures. Nearly every published photo I have was shot on that camera! I think we can say that it paid for itself, possibly a few times over. When I finally sold it it had nearly 50,000 photographs and never once gave me a problem. Unfortunately it isn’t like the days of film where the primary reason to upgrade was simply because you want a new camera. Nowadays a camera goes out of date fairly quickly and it was time to upgrade. My old camera shot 8 megapixel photos and my point and shoot camera shoots 12.1 megapixel photos! So I bought a 5d MK II. I haven’t been shooting a outside of product shots at work, and we have a camera at work, so it is a bit tough to justify this purchase. But I also can’t bring myself to not have a nice SLR. So how do I justify it? Well, I sold my old camera, it paid for half of the new one and my tax return, well that pays for the other half. The camera is also multipurpose. Not only does it shoot 21.1 megapixel photos, but it also shoots full HD videos with interchangeable lenses! This opens some doors for me! Now, if I want do do a bit of video work, well I have options! So I’ve had the camera for about a week and it has already begun to inspire me to shoot photos. 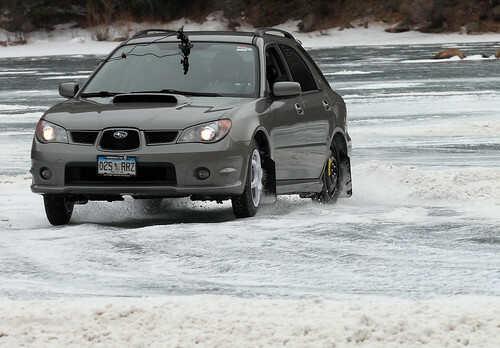 I took it to Georgetown to go ice racing. I only had a few chances to take a couple shots, but it was a good start. Then yesterday I helped out a friend with some photos. We started out in the studio and I just helped him set up everything for his own photos. 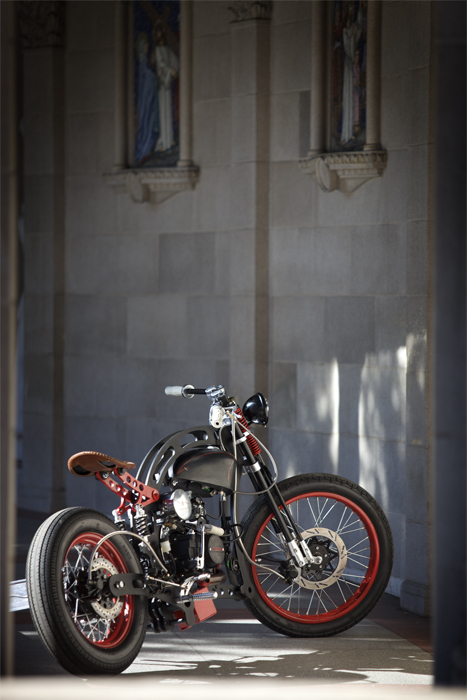 Then I took him out of the studio and we shot his custom motorcycle out in the real world. I’m looking forward to more opportunities but here are two shots for you to check out initially. 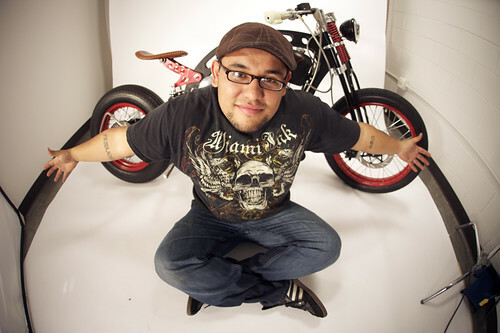 I was fortunate enough to be selected to be part of the AXYS vehicle concept design and build team. This is a hand selected program at Metro State College of Denver. The premise of this project is to build an entire composite vehicle, design all the elements of the vehicle (except the body shape) and present the vehicle to the public by the spring of 2010. The presentation portion of this will be a soft presentation, the vehicle will not be fully functional at that time and the interior will not be completed, but most of the design should be finished and the vehicle should be presentable enough to show off what it is going to be in the end. Overall this is quite the process there is an incredible amount of work to do including sanding, finishing and forming this whole thing by hand. The vehicle is going to be a two seat vehicle that leans in corners. Here is a quick rendering of the vehicle from its initial design. We are working on a website for the project right now as well. The URL is www.carbonarts.com and I invite you to check it out. Once the site is up and running we should have updates regularly to keep you informed! 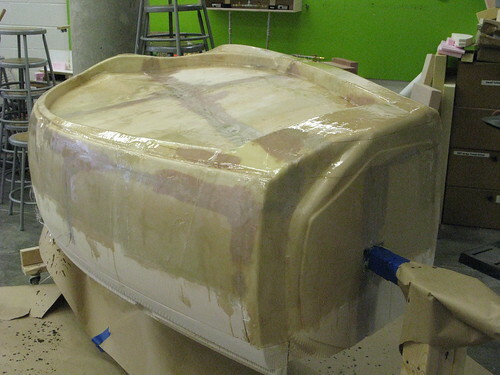 In the mean time, we will be laying up fiberglass and sanding down bondo more frequently than you can imagine! New years day was the first real day of playing this winter. I got a call from Jon Coln to go play on the ice with him. 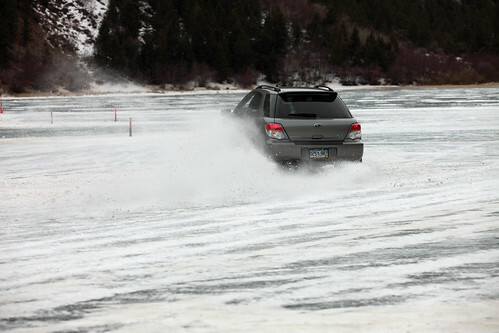 The plan was to head up to Georgetown and partake in the Our Gang Ice Racing test and tune day. We met up and piled into his car then headed up. Jon has a self proclaimed tire fetish and got his hands on a set of WRC rally tires that are studded for Ice racing. We knew this was going to be a new experience, but we also weren’t exactly sure what we were signing up for. We arrived in Georgetown and went through tech. The tires were out on display and many people were stopping by to check them out. We mounted them up and rolled out on the ice. The sound of each stud tearing away at the ice was incredible. Not only that but the ability to stop on a dime on ice that you can barely stand inspired some child like giggles from both of us throughout the day! There wasn’t really a lot of categorization during the initial hour of the Test and tune, whoever you were lined up next to was who you raced. We lined up next to a car with no studs, the flag dropped and we caught him before he got around the first corner. We stopped and waited, but at that moment a new course opened up for studs only! So we got to go play with the big guys! We found our way up to Jimmy. Turns out this is Jimmy Olson, if you check out Our Gang’s website (www.ourgangiceracing.com) you will notice his name at the top of the list pretty frequently! So this was a test. If we can beat Jimmy, these guys were either going to be impressed or they were going to lynch us…we weren’t entirely sure just yet which way this was going to go. Jimmy lined up and we lined up. Thumbs up from both drivers were signaled and finally an arm drop started the race. Jimmy’s engine roared and we took off as fast as possible. The track was fast and fairly oval in shape (they call it a peanut) with huge drifting turns on the ends. We couldn’t see Jimmy till the first drift, we were facing him and we were still in line with him! He hadn’t lost us yet. We squeezed through the first set of cones and wound around the center chicane and I looked over…we were still in line with Jimmy! We swung around the final drifting corner and, like a scene from a movie, we were perfectly in line with Jimmy! As we crossed the finishline it was close, I mean really close. I suspect that Jimmy took us by a hair, but it was close. As we pulled away, both of us giggling in the car because of how fun it was…we looked over and that same row of jeeps that pulled over to get us in line with jimmy…they were pointing and clapping or giving us the thumbs up! Apparently there wasn’t going to be any lynching today! Jon and I both have a bit of an “AV nerd” side. So of course we were going to come up with video and photo capabilities as well…right? That’s right. Besides the video quality I think that this clip came out pretty good! A few weeks later, after Jons obsession gained momentum and his self control was pushed aside, he ended up with 16 ice racing tires with 3 sets on wheels. Of course, one set just happened to fit my car… So up we went on Feb 6th to race one another, both on rally studs and both in Subarus. I was using a set of Continental Ice Racing tires made for Canadian rally. He was using a set of Yokohama tires made for WRC rally. The difference is the size and number of studs that are in the tires. The Continentals have 3 17mm studs per lug and the Yokohamas have 6 20mm studs per lug. We were able to race two races, one was an AWD event of Subaru’s and Audi’s primarily and the other was the Our Gang Competition class. The competition class is the fastest class that Our Gang runs. I was unfortunate enough to have 2 practice runs before racing, which meant I hardly had a grasp on the tires before I had to go against a nice fast Jeep! Jon kept pace however finishing 5th. We also got one of my co-workers out to the ice in his BMW 325ix. this is the cleanest 20+ year old car you have ever seen and Stephen has never really pushed it to its limits. He had a blast out there and I was glad to see him come out and test out his skills on the ice! 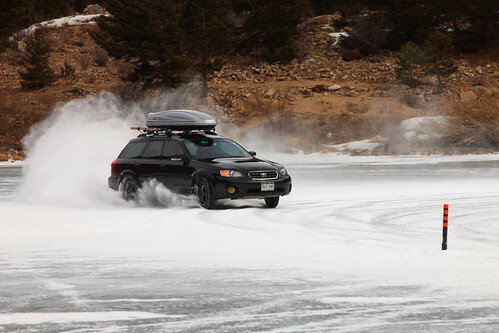 We will surely be going up again in the near future to get some more time on the ice but so far this has been one of the best driving experiences I have had in a long time! About a month ago I received a call about a chair I made a year ago. The call was asking whether or not I would be interested in putting my chair in a furniture show. OF COURSE! I would love to was my response! So lets talk about the chair. I started this project for an “Intro to Woodworking” class at Metro. Chase Deforest was the professor for the class and she was encouraging people to make small tables for a final project. I was set on a chair. Not only that, but I like mixing media so I wanted to incorporate some aluminum with the project. So I started working on some sketches. 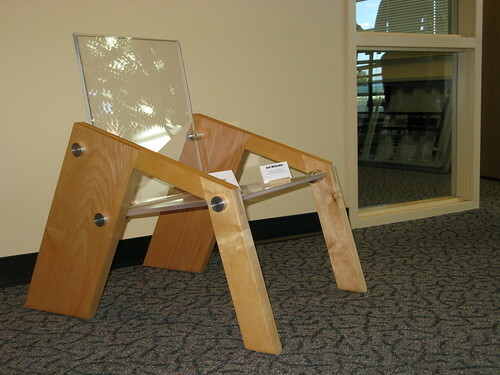 The chair developed quickly with a large heavy footprint and a light open seating area. I choose Hard Maple, Aluminum and 1/2 inch clear acrylic for my materials list. The construction went fairly smooth. 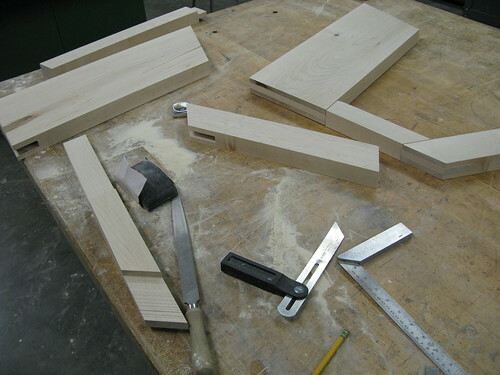 Large exposed joints came together to form the legs and the arm rails. 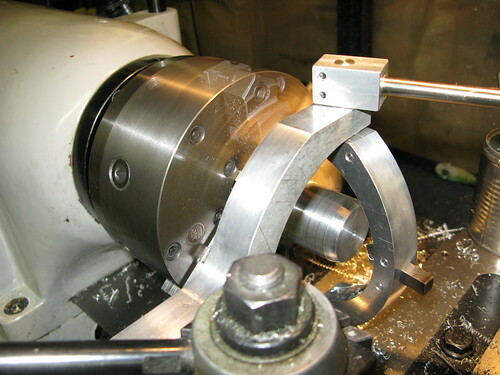 Hours in the machine shop passed by as I machined the standoffs and the acrylic…well, I ordered that. 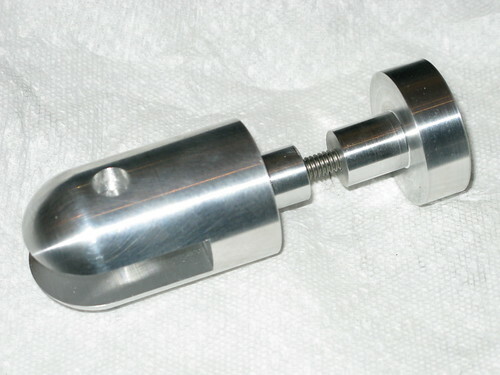 When I designed the standoffs I did so with the intention of learning how to make them. Every part I design at this point I do in order to learn how to make it. When I approached John, a good friend of mine, about the project he said “no problem!” So he showed me the Radius tool that he has and how to use it. I machined all the pieces pretty quickly. 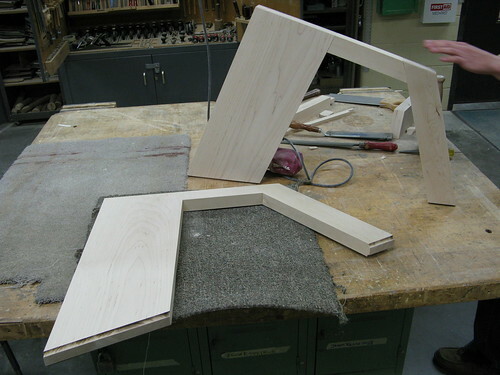 Construction went smoothly and the chair came together quickly. The standoffs turned out perfect! After assembling the chair the next challenge was to actually sit on it. What happens if it breaks! 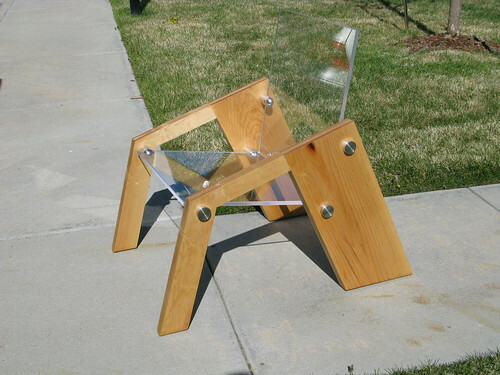 It is a bit disconcerting to sit on a clear acrylic seat for the first time, but I sat down and was pleasently surprised. It worked! In fact it worked very well. 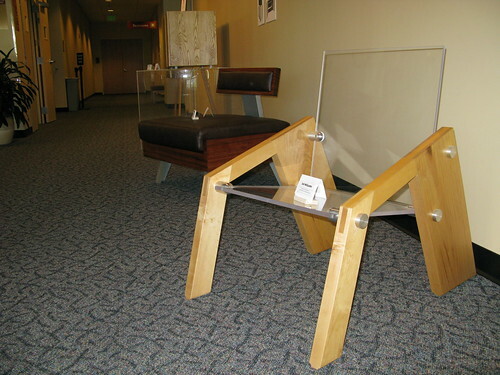 The chair is currently in the Lakewood Cultural center. A reception was held earlier this month to allow artists to talk to visitors about the pieces. Now I am working on a few new projects, hopefully I will be able to make time to get them done too! 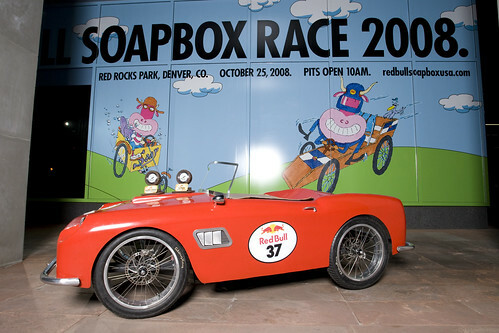 Pikes Peak International Hill Climb Race day! Spectating at Pikes Peak is NOT for everyone. It is a full commitment sort of thing. You need to know when you leave your house at 1 am that you will not be getting home anytime soon. You will be sleeping in your car, you will be eating whatever you brought with you and you will be dealing with the elements with whatever you are prepared with. You need to be ready to be isolated to one place on a mountain side for a solid 12 hours. At 2:45 am we rolled up to the line of cars that had already formed at the Pikes Peak Highway gate. We were about a mile back fromt the gate and we were ready, sleep was tough to come by even at this hour…so we waited…we chatted and we watched the row of racecars that drove up the access lane. At 4 am the gates opened and we followed the twisty road up and up the mountain. It is fun driving up there at night because you can see the headlights of the cars ahead of you traversing the road thousands of feet above and below you. We arrived at our destination, 12,760 feet above sea level, Devils Playground. We parked the car and attempted to sleep. Anticipation is the key problem to sleeping however, so sleep was light and strange. Dreams mixed with reality and eventually we awoke to see the sun shining, it was 7am, 2 more hours. We prepared for the day, a light hike to about 13,300 ft to see Boulder Park, then we would slowly make our way back to Devils playground. Cars were on their way when we arrived in Boulder Park. Actually they were on their way, completely out of order. We were fortunate to have arrived prior to the Unlimited classes departure however, so we got to see them speed past at unimaginable speeds through corners and at the edge of clifs on the way up to 14,000 ft.
We began heading back along the road in order to take advantage of a few shooting locations, but the weather began to turn, so we started making quicker time back to the safety of the car. We spend some time using the cars shelter, then time out on the course watching and spectating the race. Rain came, lightning, hail, sleet and sun… Temperatures fluctuated from cold to hot in an instant and the road’s personality was revealed. I don’t think the mountain wanted to be beaten that day. 10:15 was the fastest time, posted by Monster Tajima. Marcus Gronholm crossed the line about a minute slower, with a blown turbo and a rear wheel/tire/brake on fire. Eriksson crashed at Engineers corner, which is a popular crash location and Mark Rennison posted a mediocre time because of engine trouble. Dave and Allison Kern were looking amazing all week during practice…however their car just sounded a bit different during the race. They posted a time of 12:15 (approximately) and I came to find out that they lost an intercooler line at the start line. They went from 30lbs of boost to 4-8lbs in an instant. The power loss was dramatic but they were able to capture 2nd place even with this loss! Imagine what they will be capable of with all their horsepower available. I am already looking forward to next year. I have my fingers crossed that Gronholm and Eriksson will return ready to take on the mountain with a bit more experience under their belts. I hope to see Rennison return, maybe with a more reliable motor and I hope to see the Dave and Allison Kern return with their motor in full working order too. Pikes Peak is an amazing race, there is no other event that I am aware of that puts the spectators so close to the race, the drivers, the cars and the course. The history of the mountain is a great thing. I look forward to seeing it again… and if you are an event organizer reading this, drop me a line, i’d love to help you make this race even bigger and better than it is already. There is definitely something unique about going to bed with your alarm set for 2:30 am. Personally, I do this pretty rarely, so when I do, I have back up alarms that are extra loud and maybe even closer to my head than normal. Surprisingly it is always easier to get up than I expect. This is what it takes to spectate the Pikes Peak international Hill climb. Every year I head down to this race. Normally as a photographer for a magazine. This year however I went down simply to watch…and take photos…just not for a magazine. Thursday morning at 3:30 am, we were rolling through the gate on the way up the mountain. Darkness hides the exposure on the sides of the road as we gained elevation but onward and upward we went heading past Devils playground, Engineers corner, the W’s and many other famous corners on the mountain. We finally made it to our destination in Boulder Park. It is always a good idea to get to Boulder park first. That way your car can be the most protected from the rocks and debris that the vehicles will inevitably throw backward as they accelerate away. This year I was joined by my good friends John Grimberg and Jeremiah Hueske. Jeremiah has come to the event the last couple years…it has become a bit of a tradition and we are now collecting more people to share it with. We parked the car and shut off the lights to complete darkness at approximately 12,700 ft, the temp said it was 44 degrees, but the thin air simply chilled you to the bone when you stepped out of the car. We stayed inside, protected from the elements, watching top gear. As the sun snuck up from the horizon the mountain was revealed to us and we began listening intently for the sound of engines. Soon, the sound struck our ears and we knew the day was about to begin. Eriksson came charging past then suddenly there was a red flag. word came across the radio that his fiesta was on it’s roof! Mark Rennison had issue the day prior and was taking his practice runs in a rental car as well, so Monstar and Gronholm were showing us how fast the mountain could be driven. Among the other drivers were Rhys Millen and the Kerns. Rhys is a top drifter and he simply makes things look perfect when he drives by. His car is always sideways and he is one of the most exciting drivers to watch. The Kerns put their stamp on the race last year with an impressive time that shattered the record in their class by nearly a minute! This year they were back with 200 more horse power under the hood and a lot more technology in the car. 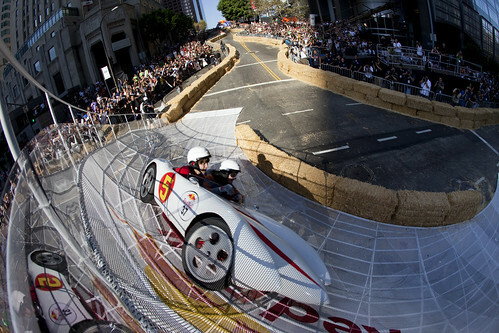 The driving was incredible, faster and faster during each practice run. You could see the line being etched into the road and the drivers beginning to find their pace as they practiced the course. As the excitement rose the time progressed and 9am came around. Practice was over. We were back to our hotel about 10 hours after we woke up and it was only noon! Friday started the same way, 2:30 rolled around and we were getting up. Packing for the day and getting ready to head up to the mountain again. This time we were headed to the lower section. We arrived at our destination, Eleven Mile, and immediately saw something we hadn’t seen before, Cars. There were nearly as many vehicles on Friday, practice day, as there normally is during the race. It was clear that the new drivers were bringing more fans! The sun began to rise and the fans emerged from their vehicles. The day was perfect, not a cloud in the sky and just a faint breeze. The first engine began up the hill and we all waited in anticipation. The motors are often so loud that you would swear that they were coming around the corner you are looking at even when the vehicle is still a mile away! Soon the first car blasted around the corner and threw a huge plume of dust into the sunlight. The car dissapeared as fast as it arrived, the entire time we saw the car it was completely sideways at full speed. This is why we come here! The anticipaction of the race began, speculation of who could take down the 10 minute barrier… Then speculation on what the weather would do and whether or not Eriksson and Mark Rennison would get their cars back together. Then of course the topic of the event came up. Pikes peak is the only event that I know of that every driver comes back, not because of the event, but because of the mountain. The draw of that mountain is strong enough that every driver that I have spoken to repeatedly says “I don’t think I want to do this anymore” but every year they are back. I am sure you are wondering why they wouldn’t want to do this anymore. The reason is simple. The race is run very poorly. The marketing, organization and, well basically everything all seem as though they undergo no planning and are simply put into place by hasty descisions and big egos. This year no timing was displayed to help boost interest in the race. Never has there been marketing in Denver…which is 70 miles away from the event. Restrictions are put on the Media at such a high level that they don’t want to show up to the race for any reason other than its history. But even though competitors feel as though they were duped, media feels unwanted and spectators have to make a large effort to spectate (this is just the nature of the race however, not a reflection on the organization) the event is successful. I can’t wait till tomorrow to head up to Devils Playground and watch fans and vehicles roar as the clock ticks. I hope to see the record fall, but a small part of me wants to see the mountain hold back that 10 minute barrier once again! All this will have to wait, because tomorrow is race day and tomorrow the mountain will decide. I will be updating this soon, so keep your shorts on!